When fifteen-year-old Curtis Jefferson, a mischievous but good-natured African-American youth, is caught crossing the blurry line between prank and delinquency, he finds himself unjustly sentenced to a yearlong confinement at the notorious Fort Grant, a penal outpost in the middle of the Sonoran Desert. Unknown to Curtis, Fort Grant is built upon the cursed site of a century-old Native American massacre. The innocent young man's character and his physical endurance are tested in the confines of a racially charged environment that includes a murderous inmate, whose sudden hatred for Curtis is fueled by his openly declared racism. Following a natural will for survival, Curtis waffles between avoidance and confrontation with his nemesis. But it is the supernatural events arising from the curse that have him fearfully questioning his grasp on reality. 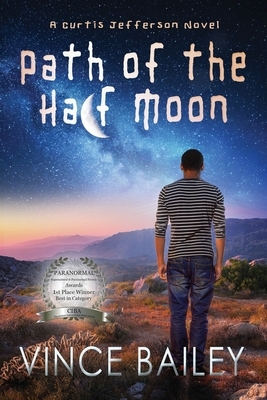 Vince Bailey's award-winning Path of the Half Moon is the Winner of the Arizona Authors' Association Literary Award and presents an edgy and thrilling escape from the ordinary.